Garden educator Marc Boucher-Colbert recently explained to me the importance of taste in our memory banks. He posited that some of our most vivid sensory memories are formed when we are children, and they often have to do with food. Being in the field or backyard garden plot and actually plucking a fruit or vegetable with our plump little hands directly from the plant and stuffing it into our mouths cements the experience in our heads like little else can. I’m standing in the backyard of Sarah and Dana Mockert’s house. The Mockerts had a house overflowing with children, and their mother kept the grocery bills low by planting their whole back yard (save a small patch for a sandbox) with a kitchen garden. For the most part, the muddy plot was strictly off limits to the kids in the neighborhood. Once in early spring, though, the three of us were drawn to the crimson red stalks and gigantic leaves of a plant in the corner of the garden. It was the first green thing to rear its head that spring, and the twins wanted to introduce me to it. I believe their explanation of the plant had something to do with dessert, and that their grandmother used it with strawberries. “It’s red like strawberries, it is a dessert, I’m in,” my eight-year-old self must have reasoned. I pulled a stalk out off the ground, brushed off the dirt and chomped into it. It was shockingly sour, astringent and had me racing for the garden hose to get the taste out of my mouth. I’m sure the Mockert twins stood by and giggled at my naiveté. “I do not like rhubarb,” I announced to my mother upon returning home. I imagine this revelation was of no consequence to her; she never baked anything at all if she could help it. She was a die-hard diet fan, and the wonders of the Scarsdale Diet were a common topic of conversation around our dining table. That tart, unpleasant memory stayed with me, and nary a speck of rhubarb crossed my lips for 27 years until I started work last year on my farmers' market-based cookbook, The Farm to Table Cookbook. While I was looking for spring produce recipes, Portland chef Vitaly Paley suggested a rhubarb-tart recipe his pastry chef had developed. Rhubarb Streusel Tarts with Brown Sugar Ice Cream, to be exact. I was skeptical, but since rhubarb is one of the first signs of spring, and other perfectly normal people seem to love the stuff, I gave it a try. When I sautéed slices of rhubarb stalks with brown sugar and a little cinnamon, the crimson, celery-like stalks melted down to a pretty pink pulp. And the smell was, well, perfectly OK. I was expecting to have to open a window or something. I put the filling into a tart shell, topped it with a buttery almond crumble topping, baked it as directed, and still wasn’t sure it would make it into the book. 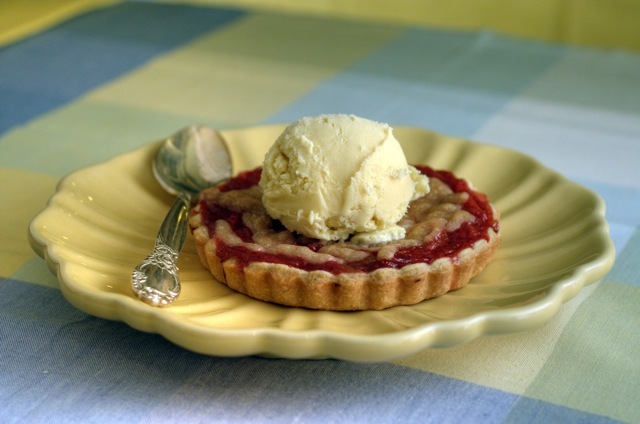 That night I served the tart, topped with the sinfully rich sour cream-based brown sugar ice cream. I tentatively dipped into the gooey red rhubarb filling, gently touched it to my tongue and grimaced in anticipation of that same caustically tart taste I remember from my gullible childhood. But surprise! First there was a little fruity tartness, and then it melted into a dance of sweet, then tart, then cinnamony goodness. A bit of cold creamy ice cream, and then a bite of the tart-sweet rhubarb, and soon I was polishing off my second helping. So that’s what I had been missing! The Mockert twins had duped me! I am making up for lost time now with my new friend rhubarb. I’ve made Indian-inspired rhubarb chutney with sautéed ginger and garam masala for grilled buffalo tenderloin, and stewed rhubarb with sugar and a vanilla bean folded it into sweetened whipped cream for an old-fashioned fool. I have even copied a recipe for my mother-in-law’s rhubarb lemonade after a really refreshing glass of it on her back porch. Come spring, I rush to the farmers' market and haul an armload home as soon as it shows its pretty stalks. Now I am converted, and all it took was about 25 years, an excellent recipe from one of the country’s best chefs, and a cookbook deal to change my mind. How strong our food memories are, indeed.